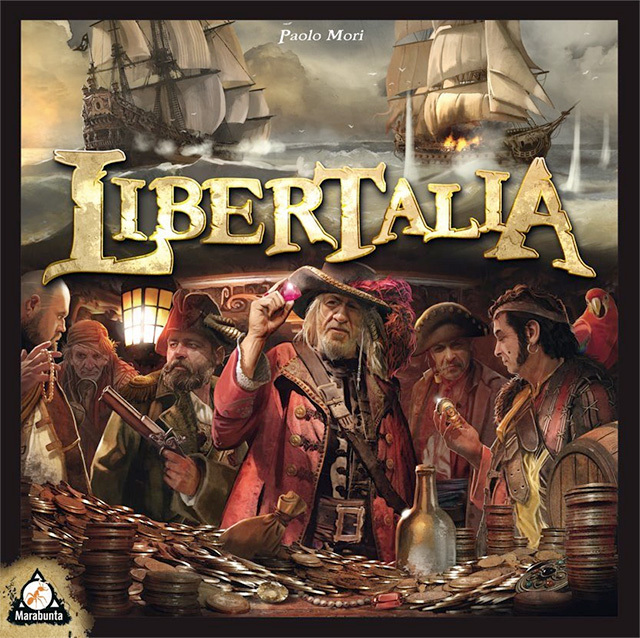 This weekend I had the pleasure of playing an early release Libertalia, a pirate-themed blind auction game. It's an elegant game with lots of replay value. It was only available in Italy until the English release this year (hence the Italian language cards below). I don't normally do board game reviews, but this game has left such a strong impression on me that it will no doubt creep into some future game design discussion. So, I post this review mainly as a future reference for those later posts. That in mind, here's a quick overview of play. Each player is competing to score the most doubloons. At the beginning of each round, random booty tokens are drawn from a bag and placed along six spaces, one space for each turn in a round. The whole game lasts three rounds. Each player has an identical deck of ranked pirate characters ranging from The Parrot all the way up to The Captain and beyond. In the first round round, players draw nine of these cards to their hand, so each player begins with the same nine cards. In ascending order of rank, the characters get to perform a "Day" action if it is noted on their card. These abilities vary and can be very useful for some disruptive strategies. In descending order of rank, each player gets their choice at the booty tokens. Most booty tokens represent a number of doubloons you can collect at the end of the round. Some tokens force you discard your character or to force another player to discard one of theirs. There are also "cursed" tokens which cost you doubloons at the end of the round. Lastly, your character card goes to your "den," a personal tableau board for each player. Each character then performs a "Night" action noted on their card. Like the "Day" actions, these abilities can be very useful even if you had a bad turn. You'll play six turns in each round. At the end of the round, any characters in your den who have an "Anchor" action will do that ability now, which can again provide some nice strategic opportunities. Between rounds, each player moves their marker along a doubloon track. Then each player draws six more of the same card from their deck. So, you know each opponent has at least six of the same options as you do. However, some day and night abilities allow you to put characters back in your hand, so there could be some surprises late in the game. The player who has the most doubloons at the end of the game wins! Art Director Review: All the information is presented clearly and evocatively. The art is superbly executed by Benjamin Carré and Stéphane Gantiez. I do wish there was less stereotypical representation of the few minority or female characters. As for the box art, the upper-third promises ship-to-ship combat, but that has no presence in actual play. The lower two-thirds are more accurate, showing a group of pirates divvying up treasure. The game definitely fulfills on that promise! Game Designer Review: This is one of those games that scratched an itch I never knew I had. It's approachable as simple blind bid auction, but the tactical effects, varying turn order and long-term strategies really deepen the game. The whole game plays in a breeze and leaves you wanting more. I'm already thinking of ways to mash this up with 6 Nimmt, Hive and Guillotine. I definitely look forward to playing this again.